The order for the new hybrid vessel sees the PLA immediately delivering on a commitment to encourage the installation of green technology, one of the 18 proposals for action in the Air Quality Strategy for the tidal Thames. In operation, the new pilot cutter is expected to deliver dramatic improvements in the PLA’s overall environmental performance. Goodchild Marine is partnering with EP Barrus for the Yanmar engines, and transmission specialists, Marine and Industrial Transmissions Limited for the Transfluid Hybrid system, to deliver a plug-in diesel hybrid pilot boat. The hull will be based on the established ‘ORC’ design, developed by French naval architects Pantocarene and adapted by Goodchild Marine for the UK market. ORCs feature a unique ‘beak’ bow design, which gives it unmatched all weather capability. The new hybrid vessel is due for delivery spring 2019. She will replace 1982 built pilot cutter, Patrol, which is powered by twin Scania diesel engines. The ORC hull design typically uses 40% less diesel per nautical mile than a conventional hull such as Patrol and fuel consumption is further reduced as the ORC is less than half the weight of Patrol. PLA chief executive, Robin Mortimer, said: “We are in the environmental vanguard in the UK ports sector – following the first green tariff and first air quality strategy with the first hybrid pilot cutter order. Introducing the hybrid boat is going to result in a major improvement in the environmental performance of our operations. The batteries of the hybrid cutter will be charged from existing shore power facilities while it’s alongside at the PLA’s Royal Terrace Pier in Gravesend. The boat will run on batteries for approximately 40 nautical miles on one charge at speeds up to 15 knots. The diesel engines will boost top speed up to 19 knots and provide a backup to the electric propulsion for longer duty cycles. The diesel engine will also charge the batteries while providing propulsion. London is the UK’s second biggest port, handling around 50 million tonnes of cargo annually; PLA pilots undertake more than 10,000 pilotage acts a year. The new pilot cutter will be used by the PLA for the transfer of pilots to and from vessels in Gravesend Reach. Alan Goodchild, managing director of Goodchild Marine, said the company was delighted to be at the forefront of technological innovation with this latest order. 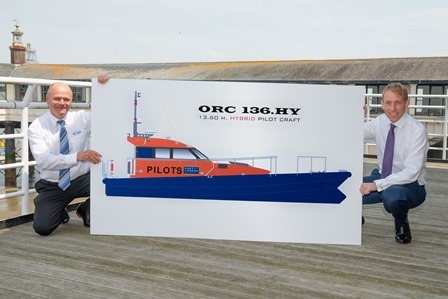 “We are extremely proud in our 40th anniversary year to have secured the contract to build what is thought to be the first hybrid pilot boat. We already have a working relationship in place with the PLA and we have drawn upon some of the most respected and talented partners in the industry to collaborate with in facilitating the project.